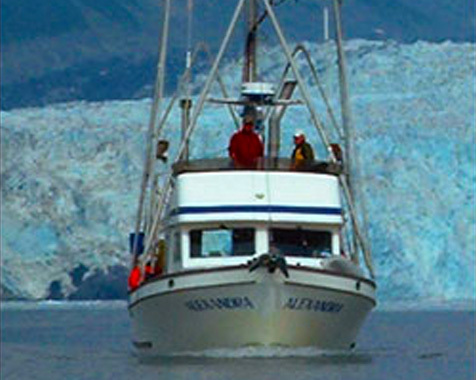 Both our Alaska charter boats, The Alexandra and The Babkin, are of solid fiberglass construction, diesel powered and have 110 volt generators for video and computer systems. The Alexandra and Babkin meet all United States Coast Guard safety requirements and our captains are United States Coast Guard licensed. 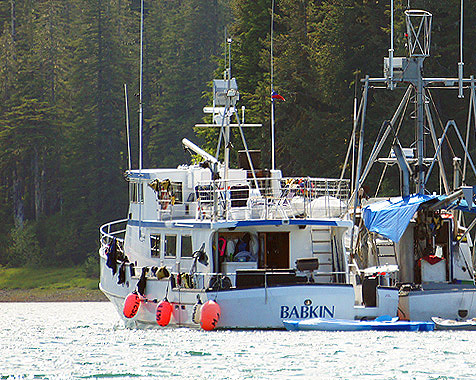 Babkin Charters operates on Chugach Forest Lands under permit from the USDA Forest Service. 58 feet (19 meters), with 3 staterooms will sleep up to 12 passengers. For day trips she can accommodate groups of 25. The M/V Babkin was constructed in Tacoma, Washington in 1997. Designed for longer length charters she is extremely seaworthy and comfortably outfitted. The interior is teak, fully carpeted and well heated throughout. Each of the three staterooms forward can sleep 3, having both a double and single bunk. A full shower and toilet (head) as well as plenty of storage space for personal belongings complete the forward layout. The galley/salon area is large and roomy and is laid out European style with 2 settees. A large back deck, flying bridge and full walk around deck provide ample outside space for freight, fishing and wildlife viewing. 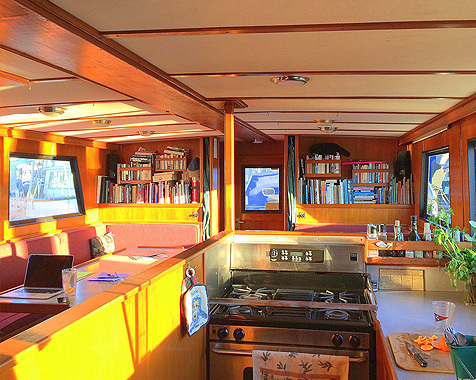 A large pilot house with crew and captains quarters also provides access to upper deck and flying bridge. 42 feet (14 meters), with the capacity of up to 6 passengers, a large deck and comfortable cabin is ideal for groups of 4-6. The F/V Alexandra was constructed in Tacoma, Washington in 1981. Designed as a combination fishing / live aboard, she is extremely seaworthy, is fully equipped, and is comfortably outfitted for longer-term trips. 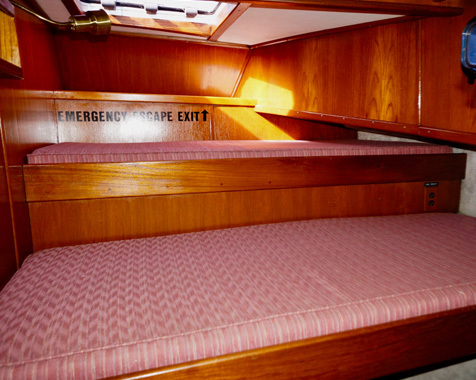 Layout: Teak interior, four large 'V' berths, head/shower and gear stowage are forward; the main cabin consists of a large galley / living area with a sliding side door and a large settee which folds down into a double berth. The aft door provides access to the back deck and the flying bridge. 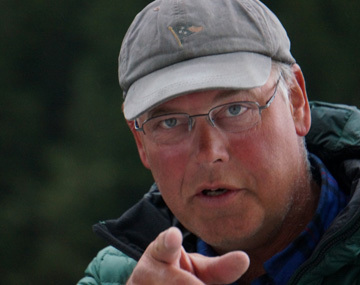 Born and raised in Anchorage with Prince William Sound in his backyard. He met his wife, Kjersti, a Norwegian and they are are busy raising three children! Brad grew up exploring Prince William Sound and Resurrection Bay with his family as a child on the family's 21 foot small open boat. 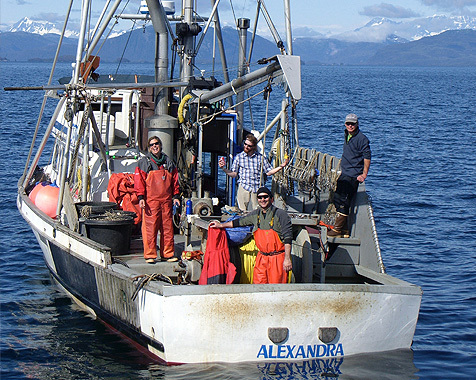 He spent his summers during college commercially fishing in a family business for shrimp, salmon, halibut, black cod. He still commercially fishes for halibut and black cod. He has a biology degree and a voracious appetite for reading! Born and raised in Anchorage with Prince William Sound in her backyard. 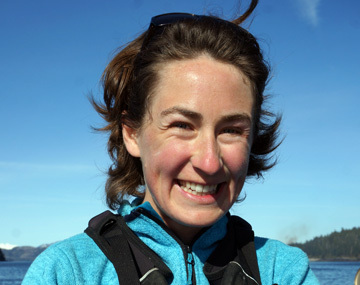 She also spent her early years exploring parts of Prince William Sound and Resurrection Bay with her family on their 21 foot boat. Her summers were spent commercially fishing for shrimp, salmon, halibut, and black cod. She still fishes for halibut and black cod. 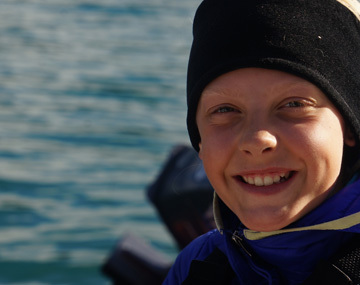 Alex loves the outdoors, skiing, and people. 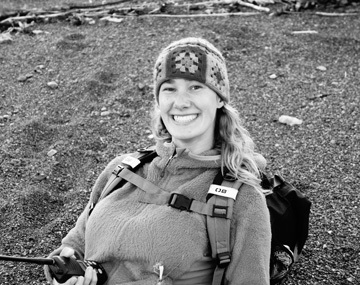 Kjersti came to Alaska via the "lower 48" while attending university. 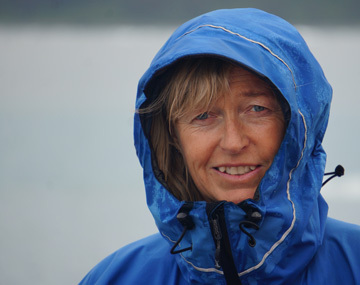 She originally hails from Norway and has been living in Alaska with her husband Captain Brad and their three children for over twenty two years. 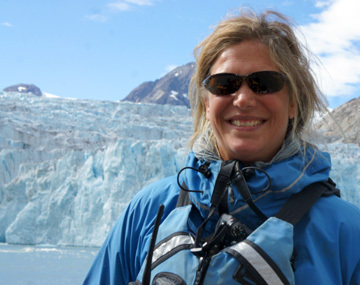 After completing her studies, Kjersti alpine ski coached for 10 years and crewed for Babkin Charters for many years prior to kids. She quietly works behind the scenes, holding down the fort while the boats are away. Originally hails from Wisconsin but fell in love with Alaska settling in Girdwood, Alaska until recently moving north to Palmer. 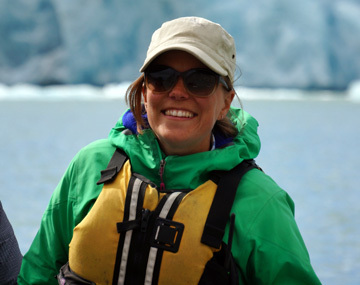 Kelly has worked for Babkin Charters for 6 years and is a librarian for the Anchorage School District. 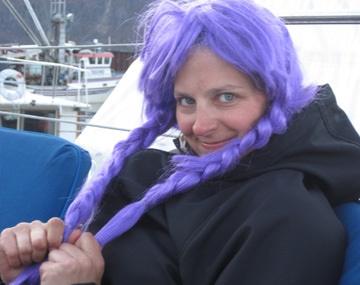 Vicky lives with her husband in the Girdwood Valley. She most recently is being certified as a massage therapist in Costa Rica. Vicky has worked for Babkin Charters for 6 years. Born and raised in Girdwood, Alaska. Laura came back to Babkin Charters after finishing her university studies. This winter, she is enjoying a fellowship in Tromso, Norway. She has worked for Babkin Charters for three years. 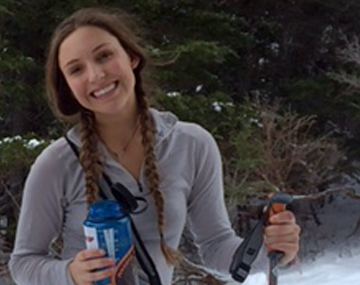 Gabi hails from Girdwood, Alaska. She started working for Babkin Charters the summer after she tore an ACL ski racing and had surgery. Her first trip was with a research trip for river otters. Gabi is finishing her university studies. This will be Gabi's third year. Maddy hails from Anchorage. 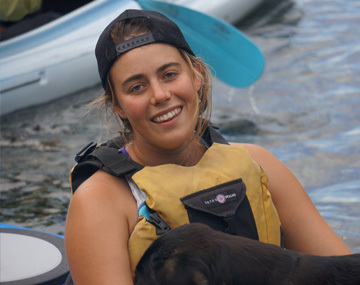 She grew up boating locally with her family out in Prince William Sound. She entered her first year of university this year. It will be Maddy's second year with Babkin Charters. Skye comes from Park City, Utah. 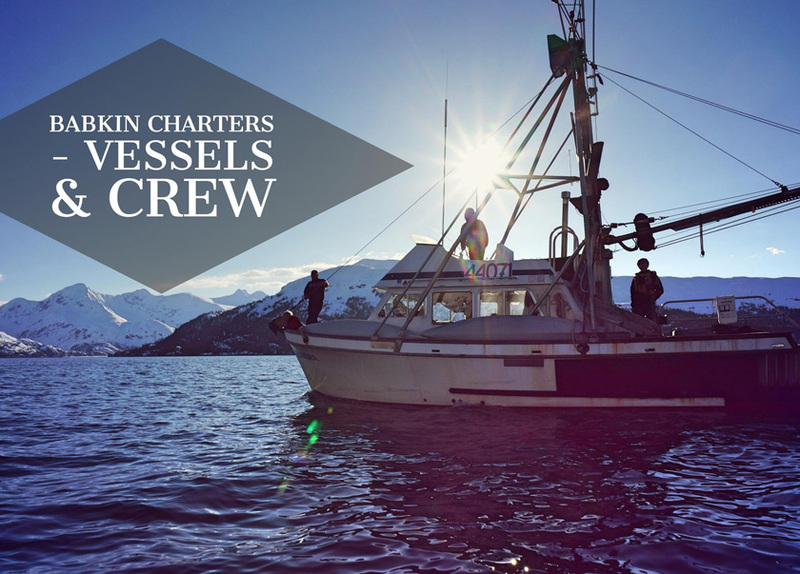 She has fallen in love with Alaska and manages to continue working for Babkin Charters between her grueling studies. She will be completing her university education this spring. Skye has worked for Babkin Charters for 2 years. Randi is Babkin Charters budding and secret weapon. She was born and raised in Anchorage and attends high school within the Anchorage school district. She drives a boat more naturally and better than she drives a car! Her passions are books and downhill skiing. 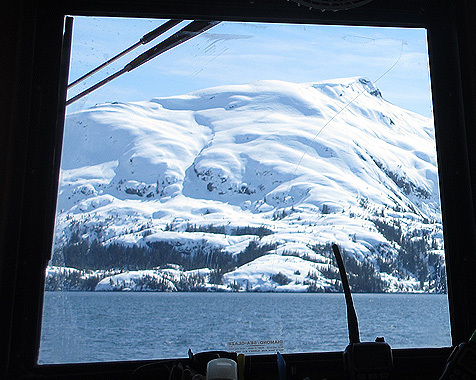 "Thank you so much for a wonderful boat trip through Prince William Sound. We saw so many beautiful spots - Jackpot Bay, the glaciers, Louis Bay, the hiking trails! And the wildlife! Bear, orcas, salmon, puffins! A very special experience we'll never forget. The boat was very comfortable, the food was great, and you were great guides as we explored the area. Your knowledge and love of the area came across, and you were always patient and positive to the groups' and each individual's needs." "I had a blast! Thanks for all your encouragement with my limited skiing ability. :) It was a pleasure getting to know you and your family."